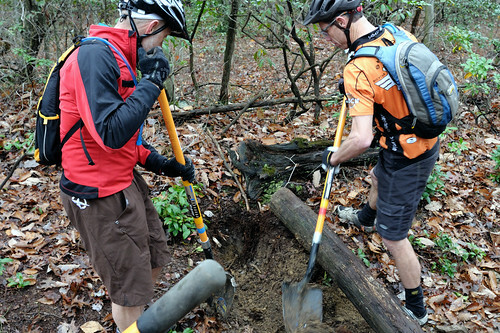 DK and some guy digging in the 'shed during city sanctioned trail building. Why they have helmets on, I can't explain. Photo from Jay D's photostream. Click for more! Bike Advocacy is a touchy subject to a lot of folks. I’ve talked to perfectly reasonable people who are vehemently against bike advocacy. Reasons cited: slow-moving bureaucracy, aversion to working with ‘sustainable parameters’, distrust of large groups, desire to be ‘the one in charge’. Bureaucracy is slow, but it’s also vital. If we work within the government system, our projects gain legitimacy and broad support. Things go from being guerilla operations to full-fledged real deal projects. State money to map and document trails in the Frederick Watershed, City money to put in bike lanes downtown, County dollars directed to making roads more safe for bikers… the list goes on. Lots of great things start underground, get big, then turn to crap. Punk rock, Hipsters, the Arab Spring… However, lots of things only gain a legit workable context that comes with scale. Hip Hop, green building practices, and bike advocacy. The notion that bike advocacy is a slow process can be true. It’s never instant gratification. Over the past two years, the Frederick Bicycle Coalition has labored to bring bike lanes to Frederick City, bike parking throughout the city, and our most recent victory, the upcoming East Street Pump Track, which just won approval this past Tuesday. A basic idea of how much person power is needed to make progress. These are trail work volunteers in the Shed for the reroute of the blue trail. Photo from Jay, again. With these basic victories, we set precedence for future advocacy actions. More bike lanes, rail trails, safe routes to schools. These projects all need government action as well as civic action, and the more we tally up, the easier future action will be. The dream is a high level of alternative transportation integration in the city and county. Make it so bikes and shoes are an actual, practical alterative solutions to cars. Working within preset parameters such as the International Mountain Biking Association’s sustainable trail building guidelines is slow, tedious and back-breaking. Rake and ride trails don’t drain properly, leave dangerous stumps under leaf cover, and can’t cope with banked surfaces. Properly built trails last longer, but take lots of work and time. Sometimes equipment has to be rented, experts brought in. 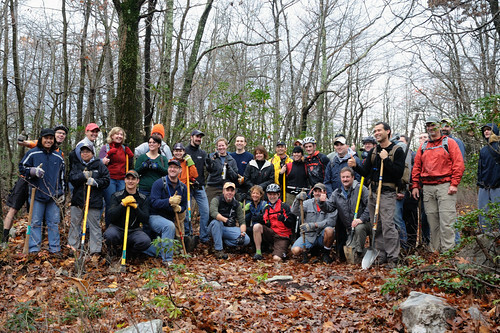 A short reroute of the blue trail in the Frederick Watershed took a number of trail work days with 30+ volunteers per work day and numerous experts to guide them. In short, good work takes time, effort and doesn’t come free. Local shops like Bike Doctor Frederick help out by contributing loads of freebies as cool volunteer giveaways. A simple, not free way to get folks out to the work days. Obviously it’s worth it. Sustainable trails that we can pass through the generations that have the blessing of the City; that’s the place to be. We’re super lucky. Frederick is a great place to be a cyclist. We have a city willing to work with us. Scratch that. We have a city eager to work with us. We dream it, plan it, and budget it, and chances are, they will say yes. All they ask is that we go in prepared. The county is in a good spot too, and although the process is less hands on and more nebulous, it’s still approachable and feasible to get things done on a larger county-wide scale. Recently, we worked with the County transportation planner to relabel small roads as cycletouring roads. Doing so would keep them small and low-speed, rather than wider, with big, supposedly safe shoulders. So it can be done. We’ll continue to do it. Mic's picture from the last FBC picnic. This by no means the full group, just the people who were still around when the picture was taken. A quick word. As the primary writer of this blog, and the Secretary of the Frederick Bicycle Coalition, I get to use this platform (small and feeble though it is) to promote whatever I want. Usually I promote tootsie rolls and orange flavored snow cones, but today it’s a post victory plug for getting involved in the cycling community. Frederick becomes a better place to ride when more people ride, and when all those people are swinging at a collective, positive ball. Like I have said, bike advocacy isn’t super fast, and if the mere concept bores you to tears, but you like seeing the fruits of it, you can still help. Join the Frederick Bicycle Coalition, its only 20 bucks a year. We’ll use your membership as a statistic, saying X number of people care enough to fork over 20 bucks a year (or more, there is no cap on how much you can give, like a super PAC.) and we’ll use the money to do good things. Help fund bike racks, help the city with bike lane costs, help bikes get recognition. The Frederick Bicycle Coalition is awesome, no doubt about it. I mean, I’m on the board, after all. However, there are a few other groups that you can get involved in, on a local level. The Frederick Pedalers are a group of road riders who meet frequently and do rides in the county. They host rides for all levels. Membership dues are similar to the FBC’s. I know a number of folks who are Pedalers and they are all, to a person, great, welcoming and friendly people. The Frederick Tri Club is a club dedicated to, you guessed it, people who race Tri’s. They meet monthly, have clinics, talk strategy, join teams, and ride together. Sometimes they meet at our shop, and we try to show them cool things, like advanced fitting technology or new fast girl (or guy) equipment. Join any of these three, today. If you already are in one, join another. Besides all of the normal reasons to join any club or organization, (if you need a list, email me) there is a really strong reason to join any of these three. Money. Bucks. Dollars. Franklins. Bike Doctor Frederick gives any card carrying FBC, Pedalers (only the Frederick Pedalers) or Frederick Tri Club members 15% off on almost all accessories. Basically, that means accessories under $500. And a good but not huge discount on stuff over 500. We make a really tiny profit on things over 500, so we can’t go the full 15%. Sorry, it’s just bike shop retail. I’ll explain the numbers, soon. So let’s say you, over the course of a year, buy a decent Jersey and a mid level helmet. That’s not much stuff, right? Well, your shop discount would more than pay for the membership. And anything you spent over those two items would just be money that never leaves your pocket. There are only two rules: no lying and you have to announce that you are a member of one of the 3 before being rung up. We won’t issue store credit (which costs us even more money) just because you forgot to clue us in before the sale was rung up. I think its fair. It’s like the senior discount. Gotta tell them you are 60+. That’s our bribe to get people involved. Maybe there is a better bribe we can offer. If so, let us know. 2/22: Rebuild a rebuildable normal Shimano style hub clinic: Shimano style hubs should be rebuilt occasionally, to keep the boogie man at bay. We’ll show you how to perform this yearly ritual. If you want to do it at home, you’ll need a few tools we can point out and source for you, including the elusive and under used axle clamp. 2/29: LIMITED CLASS SIZE…. max five, TWO positions filled already, email us at bikedrfrederick (at) gmail (d0t) com to get in on the action: James (that’s me!) will teach you how to lace a wheel (you pick, front or rear) and tension it so it won’t explode on you, or crumble like Michelle Bachmann’s presidential chances. You’ll be buying some basic spokes (or really nice ones, whatever you want) a cheap rim, and a cheap hub to learn this skill. Get something you can put on your commuter, so it doesn’t go to waste. If you want to take this class, ya gotta buy the stuff from us, but we’ll point out OK cheap stuff. Figure this class will go to about 9pm. We need to hash out what you need soonishly, so let us know, with a quickness. 3/7: First Wednesday, so it’s a fix a flat clinic. Comprehensive, to say the least. 3/14: How to overhaul and adjust a headset, assuming it can be overhauled and adjusted. What’s a headset? That thing that lets your turn the handlebars and therefore the front wheel, as well. Sometimes these get coated in sweat and grossness and need a good wash and regrease. If you generate lots of forehead sweat, or ride the trainer a lot, this is a great clinic for you. 3/21: NO CLINICS. Tent sale will be that weekend (thursday-sunday) and we will be busy and nervous. Drop off comfort food and beer for bonus points. Monday evening Flying Dog rides from Greenbrier. These are mountain bike rides, so you need a good bike and a good light and a good back up light. Lead by Herb and Jay, both affable and good guys, and friends of the shop. This is sanctioned by the park, so you won’t get arrested, because it’s legal. More info here, as well as how to sign up for those. Tuesday, Brandon and James and John are getting some medium miles in. Join them for a shortish, semi slow ride of around 40 miles. 8 am at the 7th street Starbucks. This is on for this week, barring something horrible. Call ahead to see if we are doing a Thursday ride. We might, we might not. If we do, shortish, slowish, 7 am, from the 7th street ‘Bucks. April 4th, which is a ways off, Brian will be starting his Wednesday evening climbing rides again. So stay posted on that. Follow us on Facebook. Or like us, or whatever you do with that thing. Does anyone even read this far down?? bike adventure, bike doctor in the world at large, clinics/shop events, Commuting, Cyclo-Touring, Downtown Frederick, Food Stuffs, Frederick Bicycle Coalition, Frederick Pedalers, Frederick Riding, mountain biking, Things you should be into, Townies, what's your epic?bike doctor, bike doctor discounts, bike doctor frederick, bike doctor frederick deals, bike doctor shop action, clinics, FBC, frederick, frederick bicycle coalition, Frederick Pedalers, Frederick Tri Club, frederick watershed, Group Rides, local bike advocacy, new blue, trail work, what's your epic?